This month's Birchbox was great for me. I love everything I've received and will be buying full sizes of practically everything (especially the pop-rocks-like mouthwash!) Want to see my initial review? Birchbox May Review. Glossybox collaborated with the one and only Bergdorf Goodman to curate an amazing, luxurious box of products this month - and even included a $25 gift card to Bergdorf! Want to see each product in better detail? Glossybox May Review. I feel that Ipsy knocks it out of the park every month, so of course this month's bag was no exception. I'm absolutely hooked on the curl cream, and will continue using it regularly. Want to see each product again? Ipsy May Review. While I really really loved each box/bag this month and didn't dislike anything, it makes it a little tougher. But only for like a second. Seriously, this is almost a no-brainer. With a $25 gift card to Bergdorf alone, I'd pick Glossybox. But add to that the high-end luxury products that I'm getting to really try out (especially the Revive eye cream, whose full-size retails for $350), I emphatically choose Glossybox. (I also, of course, used the gift card at once and picked up a fun-hued YSL nail polish.) 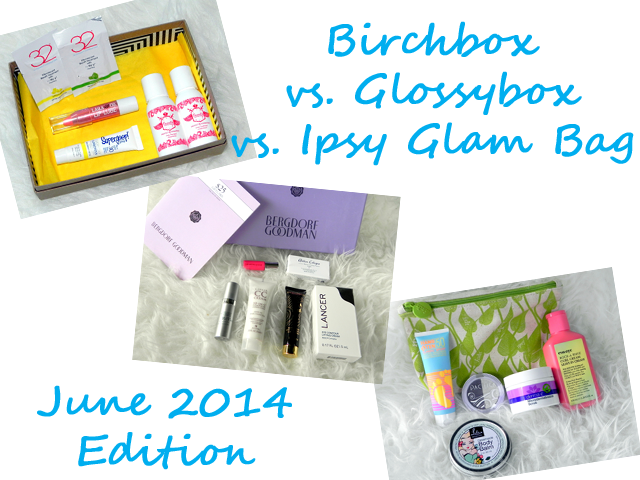 Picking a favorite between Birchbox and Ipsy is a little tougher, as both were awesome and had similar-ish values. But Birchbox had that amazing pop-rocks mouthwash (breath freshener, whatevs) so I have to pick Birchbox next. Finally Ipsy, but only because its value was rather low this month (usually it values at around $50). There it is: 1. Glossybox, 2. Birchbox, 3. Ipsy Glam Bag. Who would you pick as a winner? Did I get it right? I am getting my First Ipsy this month. I loved my May Birchbox. I do not get glossybox but am thinking about signing up for it. It seems like you get more bang for your buck with glossybox as the boxes are usually worth way more then you end up paying. I love my birchbox samples though and so far all the products I've gotten I have used and will continue to use. I am excited to get my Ipsy for June and see what is in the bag.